Wooo!!! I have officially made it to ONE FULL YEAR of blogging! It’s something I never thought I’d be able to say, and I’m already looking forward to my second year. This actually came at the best time for me; July 7 (yesterday) is the one year anniversary of “the event” (don’t really feel comfortable yet saying exactly what happened), and what better way to not mope than by celebrating with books?? 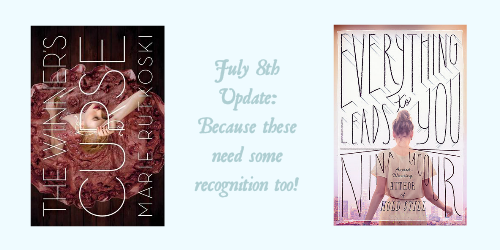 Before I move forward, let’s take a look back and some wonderful things that have happened, and enjoy a giveaway! Also: July 8 isn’t *technically* my one year anniversary – my blog was actually started in February. But I never used it, and I don’t count myself as seriously blogging until the beginning of July. So that’s when I’m celebrating, because I can! I finally settled on a blog design *maybe*. This just happened like three weeks ago, with the light blues and the birds, but I’m pretty sure it’s here to stay! Attending the LA Festival of Books in April. It was the biggest event I’ve been to in my life, and I handled it far better than I expected. I had a five minute episode of anxiety, but the rest of the weekend went flawlessly! I ended up meeting more authors than I had even dreamed of, and I was able to talk to a be surrounded by all these bookish people. I even met Charlene from Bookish Whimsy! Learning about ARCs and being approved for Heir of Fire. Not gonna lie – that email was probably the highlight of my entire Tuesday. No – it was the highlight of my Tuesday, maybe my week. That was really the moment where I felt like I had somewhat *made it* as a blogger. Making new friends! I had zero friends (not even joking or exaggerating on this) before blogging, but now I have so many lovely people I can talk to and confide in and fangirl with! Kayla of July 2013 and Kayla of July 2014 is like night and day. And the most important – getting back to reading! I only read Ender’s Game and Harry Potter rereads in my college years, but after July 2013 happened, I lost myself in books as a way to cope. I don’t NEED books to make it through my day, but now I’ve come back to my favorite hobby. A personal milestone: recovering from a 6 year hangout in the Mariana’s-Trench-level-of-low self-esteem, a 5 year stint with depression, and a 2 year love affair with anxiety. I’m not 100% better (I know I’ll have to manage it for the rest of my life), but I’d say I’m 90% free of it. I’m more confident, I can speak my mind, I know what a healthy and an unhealthy relationship looks like, and I wake up most mornings actually looking forward to life. And I don’t see myself stopping any time soon! I love writing my blog posts, whether or not anyone comments or views. But it’s so nice to know that someone out there enjoys it all ❤ I love each and every one of you guys! Thank you for sticking with me, even when I forget everything and repeat myself 8 times over. I’m going to look into self-hosting! I may now turn into just thethousandlives.com. Now wouldn’t that be amazing?? I’ve got tons of questions, so I’m going to take it all slowly. Oodles of fun and flailing in general. I’m going to try to be more active on Twitter – that’s my main goal in the next few months. I miss out on a lot, and I need to change that! Get ready – the crazy is coming. To address the very first question that comes to everyone’s mind: YES THIS IS INTERNATIONAL! As long as Book Depository ships to your country, you’re golden. And what’s the prize, you may ask? $20 to TBD, to be spent on the book of your choice. Might I suggest one of these, or one of the books in the series mentioned below? 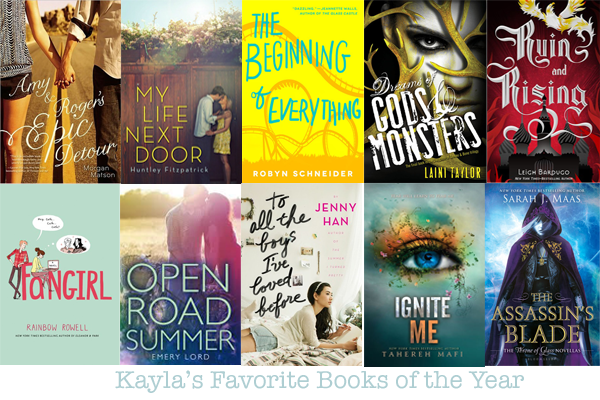 They’re my favorite books I’ve read so far this year (as of July 1 – this may change as I’m about to tackle The Winner’s Curse and it’s already fab). There’s a few more, but if I was really put on the spot these would be the top ten. EDIT ON JULY 8: See? I told you I’d have some more! These two just have to be included, because they were ohsogood. Especially Everything Leads to You ❤ I’m still reeling from the feels [I finished it last night]. So thank you all for sticking with me and celebrating today! Click HERE to be taken to the rafflecopter page, and enter away! I’ll have this going until the last day of July, so there’s plenty of time to get all those entries in. SELF HOSTED – EEEEEEEEK! It's so much fun, and so liberating, as well. I am sorry I have been a crappy Skype buddy as of late. I promise I will soon, I promise! WIFEY! You MUST read Everything Leads to You! Well,I got some new cousins! Started learning Japanese! Ooh sounds fun! I wish I could learn a language, but for whatever reason I just don’t grasp them at all. Thank you! I hope you work out a schedule soon – I know it took me about a year to figure it out, and even now I’m like ehhh maybe I’ll switch it up again. Awwww thank you!!! No worries about being late 😉 I still love you! Happy Blogversary! I’m a new follower now, great blog! Thanks for following! I hope you like the crazy 😉 Welcome to the blogosphere! The highlight of my year so far…I’m maybe 3 weeks too early but I’m close to surviving my first clinical placement, which is all sorts of fantastic, lol. Eh, three weeks is close enough 😉 CONGRATS! Thanks for the giveaway! Hope you are reading some awesome books!